It is important to select the right parts when performing hydraulic hose services. From the hoses to the clamps and everything in between, you can count on LaCava Auto Parts for quality parts and services. The acronym “STAMP” is often used by service providers to remember the most important attributes for hydraulic hoses to ensure proper installation. The letters in the acronym STAMP represent Size, Temperature, Application, Media, and Pressure. In some situations two other letters are used to stand for Environmental Factors and Delivery to create the word STAMPED. If you need assistance with Fall River auto parts and services, our team can help you find the best options for your needs. The first step is to choose the proper hose I.D. based on the flow rate requirements of your application. Sizing is essential to get the right velocity flow. Too slow and the system will perform sluggishly; but too high, and there can be excessive drops in pressure, damage to the system, and dangerous leaks. The measurement system used by the fluid power industry is known as “dash sizes” or “dash numbers” and identifies the hose and fitting size. The Dash Number is the measurement of the inner diameter (I.D.) of the hose in sixteenths of an inch. When replacing an old hose, hydraulic hose services check the layline for the printed measurement. If the printing has worn off, just cut the hose to properly measure the inside diameter after measuring the length and fitting orientation first to ensure an accurate fit. When it comes to determining temperature requirements, both the ambient temperature and the temperature of the media that will be conveyed through the hose must be considered. The temperature rating of the hose that you choose from LaCava Auto Parts should be rated to exceed the highest measurement of the media or surrounding temperature of the application. Another essential consideration is the type of media that will be used. Different fluids have the potential of increasing or decreasing the effects of the temperature on the hose. The hose specifications will display the temperature ratings when you browse hydraulic hose options at your local Fall River auto parts and services store. How you use the hose, the type of environment that it will be used in, the environmental factors that it will be exposed to, and other aspects must also be considered. If the assembly will be subjected to abrasion, if the routing will be confined, the type of mechanical loads that will be used – these can help to choose the best hydraulic hose services for the job. Specific hoses are available that will help to increase abrasion resistance or provide a greater bend radius for tight spaces. It is important to choose hoses that meet or exceed industry standards. 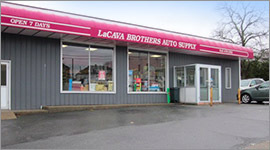 At LaCava Auto Parts, we only use Gates hydraulic hoses, which is the most trusted brand in the industry. Gates has been a leader in hydraulic hoses since 1911. The hose that you choose needs also to be compatible with the media that is being conveyed through the system. The inner tube, cover, hose fittings, and o-rings must all be compatible. This is why many customers rely on our professional hydraulic hose services, rather than attempting to make replacements and repairs on their own. 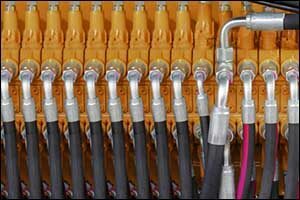 The chemicals or fluids used in your hoses will make a difference in the type of hydraulic hoses you choose. Finally, the pressure of the system is also important to prevent leaks or ruptures. You also need to be aware of any fluctuations, such as surge pressures and spikes and adjust your needs accordingly. Choose a Gates hydraulic hose that has a maximum working pressure that is greater than the maximum system pressure, as well as any peak pressures found in the system. If you aren’t sure which hoses you require, speak with a representative at our Fall River auto parts and services center. Quality services are important to the success of any piece of equipment, repair job, or project. Our selection of Gates hoses in a wide range of pressure ranges, abrasion resistance, and application requirements can help to provide the ultimate fluid conveyance system. Our hydraulic hose services are available 24 hours a day, seven days a week. Call our Fall River store for more information about hydraulic hose services, as well as any of other our professional automotive industry services. You can visit our location on Bedford Street, use our online contact form, or give us a call at 508-676-1951 to speak with a team member.